Years ago, Missionary Ventures helped young Pastor Nikolai Zalutsky, who is now a Bishop, to start a Bible school in Pskov, Russia. He had a vision to plant churches all over Russia. 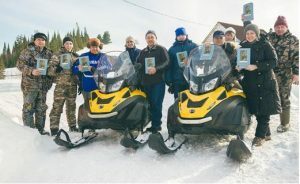 With help from the Christian Motorcyclists Association, MVI helped them purchase two snow mobiles to reach remote areas of Siberia. Through the Bible school, there are now 50 teams involved in planting churches. In the last 5 years, more than 900 churches were planted, people in 19,050 villages heard the Gospel, and 2.9 million people indicated they had become Christians.